Clarence and Rudine Ridgley can feed their entire block with the produce from their "Edible Estate," a community garden and art project commissioned by the Contemporary Museum in Baltimore. 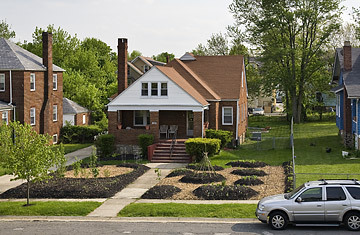 Clarence Ridgley is the most popular guy on his block, and it's all thanks to his lawn. In April, Ridgley transformed his neatly trimmed yard into a garden of tomatoes, blueberries, strawberries, lettuce, beets and herbs. And because the plot sits in front of his home in Baltimore, the bountiful harvest is visible  and available  to anyone who wanders by. "People will come to my yard and pick up an onion sprout and start eating it on the spot," he says. "I've met more people in the past two months than I have the past 22 years of living here." Ridgley is one of five homeowners in the U.S. to participate in the project known as "Edible Estates," in which homeowners trade their mowed and ornamental lawns for artistic arrangements of organic produce. Los Angeles-based architect Fritz Haeg launched the campaign in July 2005, after pundits and politicians had divided the country into Red and Blue states for the presidential election. Haeg says he was drawn to the lawn  that "iconic American space"  because it cut across social, political and economic boundaries. "The lawn really struck me as one of the few places that we all share," he says. "It represents what we're all supposedly working so hard for  the American dream." The problem, as Haeg sees it, is that the "hyper-manicured lawn" is looking increasingly out of date. In the 1950s, when suburbia first began to sprawl, a perfectly trimmed front yard embodied the post-war prosperity Americans aspired to. Today, amid rising fuel costs, food safety scares and growing environmental awareness, a chemically treated and verdant but nutritionally barren lawn seems wasteful, he says. The concept of tilling one's front yard is not a new one. In 1942, as the U.S. emerged from the Great Depression and mobilized for World War II, Agriculture Secretary Claude R. Wickard encouraged Americans to plant "Victory Gardens" to boost civic morale and relieve the war's pressure on food supplies  an idea first introduced during The Great War and picked up by Canada, the U.S. and Great Britain. The slogan became "Have Your Garden, and Eat It Too." Soon gardens began popping up everywhere, and not just American lawns  plots sprouted up at the Chicago County Jail, a downtown parking lot in New Orleans, and a zoo in Portland, Ore. In 1943, Americans planted 20.5 million Victory Gardens, and the harvest accounted for nearly one-third of all the vegetables consumed in the country that year. Though Haeg's creative approach to home-grown produce is unique; his enthusiasm for gardening is not. Twenty-five million U.S. households planted vegetable and fruit gardens in 2007, according to Bruce Butterfield of the National Gardener's Association, and that number is expected to increase by several million this year. The waiting list for the USDA's Master Gardener Program, which involves nearly 90,000 volunteers in all 50 states who educate and assist the public with horticulture projects, is getting longer every year, says Bill Hoffman, National Program Leader for Agriculture Homeland Security. Even urban dwellers are returning to the land; in Austin, Texas, for example, the wait for community gardens is three years. "It comes as no surprise to me," Butterfield says. "Gas prices, food prices, salmonella  the world has gone absolutely crazy. And for a lot of people, that brings up this need to take control over what happens in their own yard. If all goes to hell, you can just lock the gate and stay at home." In fact, the average American garden has proven to be a surprisingly accurate social and economic barometer. The upsurge in fuel prices in 1975 spawned a similar gardening boom, with nearly 49% of the population growing some sort of produce. Then, as the prosperity of the '90s trickled down to American yards, the pendulum swung back toward aesthetics over sustenance. "Back in the 1990s, when things were booming, the gardening movement was all about Martha Stewart  spending lots of money hiring people to make these beautiful, ornamental spaces," says Charlie Nardozzi, senior horticulturist at the National Gardening Association. Nowadays, "growing your own food can be a political statement that you have a personal connection with your food and where it's coming from, versus going to a grocery store and grabbing whatever is on the shelf." But while some gardeners might be trying to save a few bucks or avoid commercially farmed produce, many horticulturists believe the gardening boom is more about lifestyle than economics. And unlike the concept of government-sponsored, "top-down" Victory Gardens, Edible Estates is a grassroots effort. Ridgley, for one, says his garden is as much about community and beauty as it is about food. "This is an art exhibit that just happens to be in my front yard," he says. Haeg, meanwhile, hopes his project will prompt more Americans to rethink their yards, and where they plant their gardens. He hopes to plant two more Edible Estates next year. "This is a wonderful opportunity to reconsider how we're living, which I don't think is so great anyway." And with 80% of Americans living in homes with access to a yard, the potential for growth is enormous. As Haeg says, "the front lawns are there waiting."